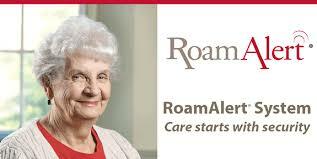 RoamAlert wander prevention systems, using reliable FM technology, enhance residents’ safety and security. Wander prevention solutions from industry leaders such as Roam Alert allow staff members to monitor resident movements and prevent them from entering restricted areas. 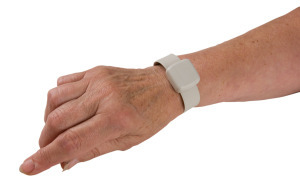 Residents can move freely through designated areas in the facility, while assuring them that help is just the press of a badge or bracelet button away. Day-to-day activities are further enhanced through system features that, in addition to monitoring resident movement, unlock doors, turn on lights, and alert caregivers if clients are in off-limit areas. Reliable technology. The RoamAlert solution uses highly reliable FM technology designed to handle interference from other radio frequency devices. Small resident tag. The RoamAlert tag is small and lightweight, only a third of an ounce and one inch across. With no hard edges, it is safe to use even on the most delicate skin, and so small that residents and family will barely notice it. Personalized resident protection. No other system offers as many options for customizing protection for each resident—letting them pass through some exits, but not others—giving them the maximum possible freedom. Scalable and expandable. 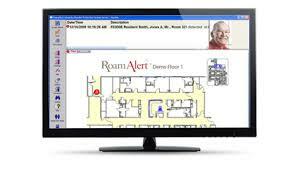 RoamAlert lets you start with one or two doors for perimeter protection and expand up to a community-wide system for wander management, emergency response and resident locating. Wander protection is just one more solution that can increase the satisfaction of your residents and their families, maximize the efficiency of your staff, promote resident independence, monitor activities and prevent emergencies. COULD YOUR RESIDENTS BE SAFER?